Ever since 'Mr. 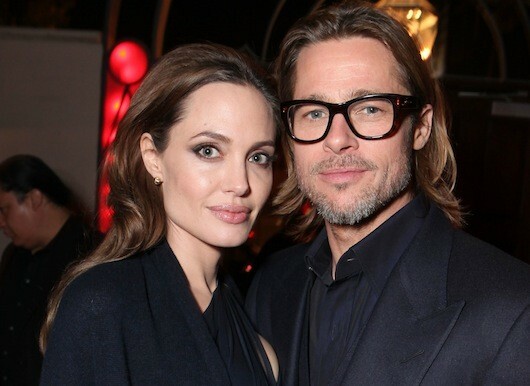 & Mrs. Smith,' Brad Pitt and Angelina Jolie have been one of Hollywood's most-famous star couples (sorry, Jen! ), but with the exception of that 2005 action film the pair haven't worked together onset since. Now that Jolie has stepped behind the camera for 'In the Land of Blood and Honey,' will that change? If Pitt has his way, absolutely. When that quote was relayed to the actress, whose directorial debut opens later this month, she seemed pleased. "Well, you know, I'd be extremely lucky to [direct him," she said. "He's one of my favorite actors! He's so extraordinary, so I'd be lucky, but still shy. I'd be shy to give him direction. We'll talk about it tonight." Jolie used Pitt as a sounding board while writing the script for 'In the Land of Blood and Honey,' a love story set against the backdrop of the Bosnian war. "I don't watch TV and I wasn't reading anything. So I started writing. I went from the beginning to the end. I didn't know any other way," she told Vanity Fair earlier this year, before revealing that she passed the script along to Pitt. "He called and said, 'You know, honey, it's not that bad.'" Jolie, who was at the center of a 'Blood and Honey' lawsuit controversy earlier this week, is not in 'Blood and Honey,' but her directorial debut hits on Dec. 23 in limited release.